Offering Two Rakat Nafilah before Fajr salaat is recommended. I have laid hold of the firmest handle of Allah (saws) which shall not break off and I have clung to the strong rope of Allah. I seek refuge with Allah from the outbursts of the Arab and the non-Arab, and I seek refuge with Allah from the evil of the devils from the man and jinn. I trust in Allah. I seek the fulfillment of my needs from Allah. Allah is enough for me and He is the best Procurator, there is no power or might but by (the will of) Allah the Sublime, the Mighty. 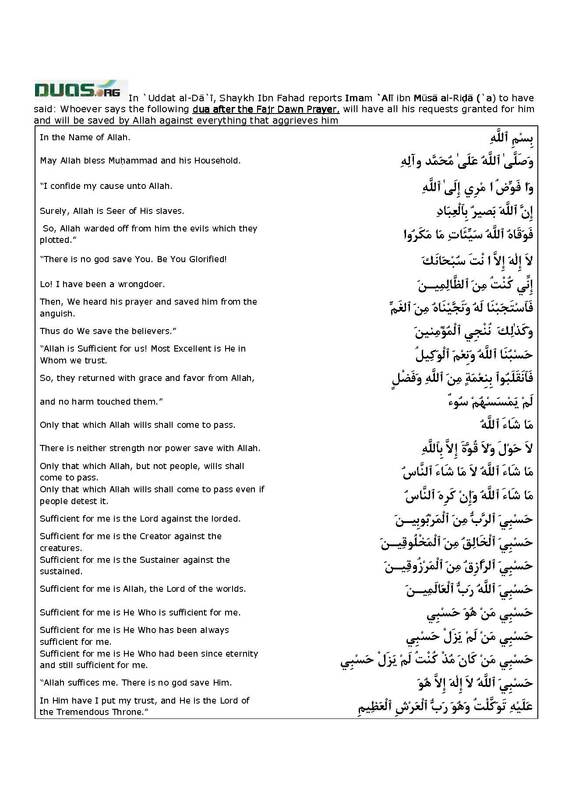 It has been reported from Imam Jafar Sadiq (as) that whoever recites 100 times following will not encounter any unpleasantness during that day. Recite 11 times Sura Ikhlas, and 10 times Sura Qadr. Imam Muhammad Baqir (as) that whoever recites the following 10 times ,Allah(swt) will protect him from blindness, insanity, leprosy, distress, senility. All Praise and Glory be to Allah, the Supreme And there is no power or power-acquiring Except through God, the High, and the Mighty”. Subhanallahil azimi wabe hamdehiwa la hawla walaquwatailla billahil aliyul azim. May Allah bless Mu¦ammad and his Household. “I confide my cause unto Allah. Surely, Allah watches His slaves. “There is no god save You. Be You Glorified! Lo! I have been a wrongdoer. Then, We heard his prayer and saved him from the anguish. “Allah is Sufficient for us! Most Excellent is He in Whom we trust. Only that which Allah wills shall come to pass. There is neither strength nor power save with Allah. Only that which Allah, but not people, wills shall come to pass. Only that which Allah wills shall come to pass even if people detest it. Sufficient for me is the Lord against the lorded. Sufficient for me is the Creator against the creatures. Sufficient for me is the Sustainer against the sustained. Sufficient for me is Allah, the Lord of the worlds. Sufficient for me is He Who is sufficient for me. Sufficient for me is He Who has been always sufficient for me. Sufficient for me is He Who had been since eternity and still sufficient for me. “Allah suffices me. There is no god save Him. There is no god save Allah, the glorious, the supreme. There is no god save Allah, the mighty, the oft forgiving. There is no god save Allah, the one, the dominating. There is no god save Allah, the single who has no associate, the only god, we surrender ourselves to his will. There is no god save Allah, Muhammad is the messenger of Allah, Ali is the vicegerent of Allah. Blessing of Allah be on his best creation, the manifestation of his pleasure, Muhammad and all his pure, pious and clean children, on account of your mercy, O the most merciful. Allah is sufficient for us, he is the best supporter, the best master, the best helper. لَا اِلٰهَ اِلَّا اللهُ الْجَلِيْلُ الْجَبَّارُ لَا اِلٰهَ اِلَّا اللهُ الْعَزِيْزُ الْغَفَّارُ لَا اِلٰهَ اِلَّا اللهُ الْوَاحِدُ الْقَهَّارُ لَا اِلٰهَ اِلَّا اللهُ وَحْدَهٗ لَا شَرِيْكَ لَهٗ اِلٰهًا وَاحِدًا وَ نَحْنُ لَهٗ مُسْلِمُوْنَ لَا اِلٰهَ اِلَّا اللهُ مُحَمَّدٌ رَسُوْلُ اللهِ عَلِيٌّ وَلِيُّ اللهِ وَ صَلَّي اللهُ عَلٰي خَيْرِ خَلْقِهٖ وَ مَظْهَرِ لُطْفِهٖ مُحَمَّدٍ وَ اٰلِهٖ اَجْمَعِيْنَ الطَّيِّبِيْنَ الطَّاهِرِيْنَ بِرَحْمَتِكَ يَا اَرْحَمَ الرَّاحِمِيْنَ حَسْبُنَا اللهُ وَ نِعْمَ الْوَكِيْلُ نِعْمَ الْمَوْلٰي وَ نِعْمَ النَّصِيْرُ. Asbahto billahi moomenan ala deene Muhammadin wa sunnatehi wa deenil ausiae wa sunnatehim aamanto besirrehim wa alniyatehim wa shahedehim wa ghayebehim wa aaoozu billahi mimma asta aaza minhu rasoolillahi sal allaho alaihi wa aalehi wa alal ausiyae salawaat ullahi alaihim wa arghub ilallahi feeha raghebu ilaihi wa la haula wa la quwwata illa billahi. O Allah (saw) Set right for me the religion that You have made a safeguard for me [three times]. O Allah! Set right for me this world that You have made me live in [three times]. O Allah! Set right for me my hereafter that you have made my place of return [three times]. O Allah! I seek refuge with Your pleasure from Your ire and I seek refuge with Your forgiveness from Your wrath [three times]. O Allah! I seek refuge with You – nobody can deny to the one whom You have given, and nobody can give to the one whom You have denied, and nobody’s efforts come to fruition without You. أَللّٰهُمَّ أَصْلِحْ لِي دِيْـنِيَ الَّذِي جَعَلْتَهُ لِي عِصْمَةً. أَللّٰهُمَّ أَصْلِحْ لِي دُنْـيَايَ الَّتِي جَعَلْتَ فِيهَا مَعَاشِي. أَللّٰهُمَّ أَصْلِحْ لِي آخِرَتِيَ الَّتِي جَعَلْتَ إِلَيْهَا مَرْجَعِي. أَللّٰهُمَّ إِنِّي أَعُوذُ بِرِضَاكَ مِنْ سَخَطِكَ، وَأَعُوذُ بِعَفْوِكَ مِنْ نِقْمَتِكَ. أَللّٰهُمَّ إِنِّي أَعُوذُ بِكَ لاَ مَانِعَ لِمَا أَعْطَـيْتَ وَلاَ مُعْطِيَ لِمَا مَنَعْتَ وَلاَ يَنْفَعُ ذَا الْجَدِّ مِنْكَ الْجَدُّ. O Allah (saws) ! Grant me the use of my hearing and sight and let them stay with me till my death and show me the destruction of my enemies. From Sayyid Ibn Tawus in al-Iqbal: Narrated from Jafar ibn Muhammad (saws) "Muhammad" from his father who said in a hadith: When the Noble Prophet (saws) "Holy Prophet" had completed his morning prayer, he would (continue to) face the Qiblah until sunrise, invoking Allah (swt) At this time, Ali (saws) ibn Abu Talib would come forward and sit behind the Noble Prophet and the people would come to seek permission to ask for their needs, and this is what the Prophet of Allah (saws) "Prophet of Allah" had instructed them to do. O Allah (saws) ! I seek protection with You from grief and sorrow, weakness and laziness, miserliness and cowardice, turning away from the truth and idle talk of men, wasting time and negligence, vileness and cruelty, destitution and poverty. And I seek protection with You from the self that never gets satisfied, the heart that does not humble itself, the eye that does not shed tears, the supplication that is not heard, the prayer that does not benefit. And I seek protection with You from a woman who makes me old before my time, and I seek protection with You from a son who subjugates me, and I seek protection with You from wealth that is a torment for me, and I seek protection from the deceiver who conceals any good that he sees and propagates any evil that he sees. O Allah! Do not let an insolent one ever do me a favor and do not make him expect anything from me. أَللّٰهُمَّ إِنِّي أَعُوذُ بِكَ مِنَ الْهَمِّ وَالْحُزَنِ، وَالعَجْزِ وَالْكَسْلِ، وَالْبُخْلِ وَالْجُبْنِ، وَضَلْعِ الدِّينِ وَغَلَبَةِ الرِّجَالِ، وَبَوَارِ الأَيَّمِ وَالْغَفْلَةِ، وَالذِّلَّةِ وَالْقَسْوَةِ، وَالْعَيْلَةِ وَالْمَسْكَنَةِ. وَأَعُوذُ بِكَ مَنْ إِمْرَأةٍ تُشَيِّبُنِي قَبْلَ أَوَانَ مَشِيبِي، وَأَعُوذُ بِكَ مِنْ وَلَدٍ يَكُونُ عَلَيَّ رَباًّ، وَأَعُوذُ بِكَ مِنْ مَالٍ يَكُونُ عَلَيَّ عَذَاباً، وَأَعُوذُ بِكَ مِنْ صَاحِبِ خَدِيعَةٍ، إِنْ رَأى حَسَنَةً دَفَنَهَا، وَإِنْ رَأى سَيِّئَةً أَفْشَاهَا. أَللّٰهُمَّ لاَ تَجْعَلْ لِفَاجِرٍ عَلَيَّ يَدْاً وَلاَ مِنَّةً. O "Allah" ! The day has come while my oppression has sought refuge in Your Forgiveness, and my sins have sought refuge in Your Pardon, my fear has sought refuge in Your Security, my weakness has sought refuge in Your Strength and my transient existence has sought refuge in Your Everlasting Existence. Grant me well-being, and cover me with Your Mercy, and honor me with Your Nobleness, and keep me safe from the evil of Your creation, from the jinn and man. O Allah! O Compassionate! O Merciful! أَلْبِسْنِي عَافِيَتَكَ، وَغَشِّنِي بِرَحْمَتِكَ، وَجَلِّلْنِي كَرَامَتَكَ، وَقِنِي شَرَّ خَلْقِكَ مِنَ الْجِنِّ وَالإِنْسِ يَـا اللّٰهُ ياَ رَحْمٰنُ ياَ رَحِيمُ. 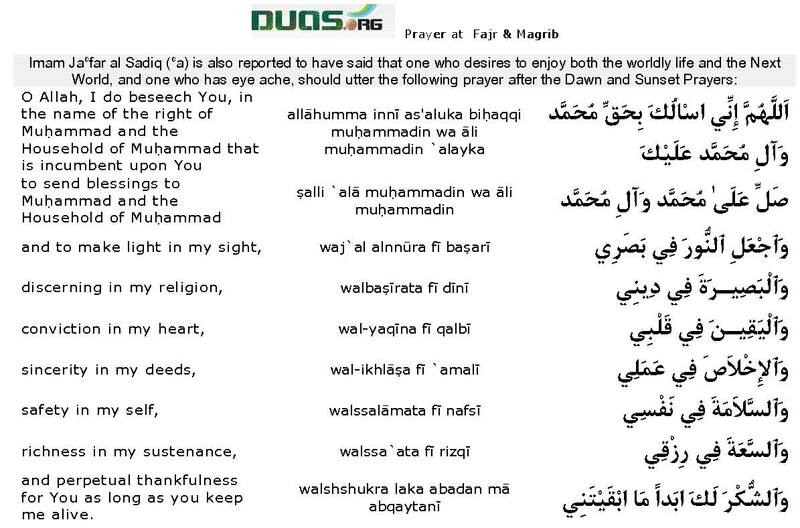 It is also narrated from the Prophet of Allah (a.s.) that one who recites the following supplication before the sunrise, an angel will take it on its wings and go to the Firmament . When it arrives there, the other angels ask him what it was carrying. It says that it was carrying the supplication of a momin. The angels then pray to Allah for the acceptance of the momin’s supplication. Similarly all the angels and the people of the Firmament will pray on his behalf. This supplication is treasured with the record of the good deeds of the Momin. :- Allaho akbar Allaho akbar kabeeran wa subhan allahi bukratan wa aseela walhamdulillahi rabbil aalameena kateeran la shareeka lahu wa salallaho ala Mohammedin wa aalehi. and guide me, by Your permission, to the right about which discrepancies have taken place. Verily, You guide him whom You wish to a straight path. and confer upon them the best of your favors. and their souls and bodies. Allah’s mercy and blessings be upon them. and make me die on the principles for which `Al¢ the son of Ab£-±¡lib—peace be upon him—died. (1) I pray the forgiveness of Allah and I repent before Him. (2) I beseech Allah for good health. (3) I seek Allah’s protection against Hellfire. (4) I ask Him for Paradise. (5) I ask Allah for the Paradisiacal Women. (6) There is no god save Allah the King and evident Truth. (8) May Allah send blessings to Mu¦ammad and the Household of Mu¦ammad. and there is neither might nor power save with Allah, the All-high and All-great. (10) Only that which Allah wills shall come to pass and there is neither might nor power save with Allah, the All-high and All-great. in them, and amid them. and depart those whom they depart. against the evil of all that which I fear, O All-great. In Tahdhub al-Ahkam (by Shaykh al-Tusi), it is reported that whoever repeats the following ten times after the Dawn Prayers, Almighty Allah will save him from blindness, insanity, leprosy, poverty, and (house) demolition :This supplication, which is reported from Imam `Ali Amir al-Mu'minun (`a) at the Night of Mabut,is said each morning and evening. there is neither might nor power save with Allah, the All-high and All-great. and perpetual thankfulness for You as long as you keep me alive. Alternate translation “O Lord I ask you In the name of Muhammad and his line of Progeny To have Mercy on Muhammad and his posterity. And (through them) grant me (also) The light in my eyes, the true understanding /insight of my faith The (Divine) Certainty in my heart The sincerity in my actions and peace in my mind And vastness in the means of my living And gratitude unto You As long as you decide to keep me alive”. There is neither might nor power except with Allah. I put my trust in the Ever-living (Lord) Who never dies. and magnify Him with all magnificence. One, Unique, and eternally Besought of all. and we are submissive to Him. even though the polytheists may detest it. (He is) Our Lord and the Lord of our fathers of old. and defeated the parties alone. So, sovereignty be His and praise be His. while He is eternally ever-living and He never dies. the Ever-living and Self-Subsisting; and to Him do I turn in repentance. and give me sustenance from whence I think and from whence I do not think. may Allah bless him and his Household (I follow). and in front of me. and the tightness of graves. I pray Your protection against the calamities in nights and days. (please) convey peace to Muhammad and the Household of Muhammad on behalf of me. بِـ: «قُلْ اعُوذُ بِرَبِّ ٱلْفَلَقِ. وَمِنْ شَرِّ غَاسِقٍ إِذَا وَقَبَ. وَمِنْ شَرِّ ٱلنَّفَّاثَاتِ فِي ٱلْعُقَدِ. بِـ: «قُلْ اعُوذُ بِرَبِّ ٱلنَّاسِ. ٱلَّذِي يُوَسْوِسُ فِي صُدُورِ ٱلنَّاسِ. Praise be to Allah as many as what Allah has created. Praise be to Allah as same as what He has created. Praise be to Allah as full as what He has created. Praise be to Allah as much as the ink of His Words. Praise be to Allah as weighty as His Throne. Praise be to Allah as much as it pleases Him. There is no god save Allah the Forbearing and All-generous. There is no god save Allah the Most High and All-great. and the Lord of the great Throne. and gloating of the enemies. I pray Your protection against poverty and rupture. with regard to the wife, the property, and the children. O Allah, (please do) bless Muhammad and the Household of Muhammad. If this man comes on the Resurrection Day abiding by these prayers without neglecting them deliberately, all the eight gates of Paradise will be opened before him so that he can enter from any gate he wishes. ” However, according to another tradition that is reported through valid chains of authority, a different prayer has been mentioned. اَلْحَمْدُ لِلهِ الَّذِيْ سَتَرَ ذُنُوْبِيْ وَ عُيُوْبِيْ وَ لَمْ يَفْضَحْنِيْ بَيْنَ الْخَلَایِقِ. اَللّهُمَّ اِنّى اُشْهِدُكَ اَنَّهُ ما اَصْبَحَ بى مِنْ نِعْمَةٍ اَوْ عافِيَةٍ فى دينٍ اَوْ دُنْيا فَمِنْكَ وَحْدَكَ لا شَريكَ لَكَ لَكَ الْحَمْدُ وَلَكَ الشُّكْرُ بِها عَلَىَّ حَتّى تَرْضا وَبَعْدَ الرِّضا. Recite -Allaho akbar Allaho akbar kabeeran wa subhan allahi bukratan wa aseela walhamdulillahi rabbil aalameena kateeran la shareeka lahu wa salallaho ala Mohammedin wa aalehi. Recite : “In the name of God, the Merciful, the Compassionate. I give, hereby, myself And all that God has give me In the custody of Allah, The one, The Everlasting, Who begets not. Nor has He been begotten. Nor there is one equal to Him! And I, hereby, take refuge with myself And that God has given me With the Lord of Day break From the evil of what He has created And from the evil of darkness when it gathers. And from the evil of those women who blow on knots And from the evil of envious when he envies. And I take refuge with myself and all that God has given me With the Lord of men, The King of men, the Sustainer of men From the evil or the slinking whisperer Who whispers in the breasts of men Of Jin and Men”. Recite “I seek refuge in Allah, the Hearing, the Knowing, from the evil suggestions of Shaitans and seek refuge in Allah from their presence. Surely Allah -- He is the Hearing, the Knowing”. Then recite: “O Allah! Who transforms hearts and eyes, may my heart steadfast to Thy religion. And make not my heart to deviate after Thou hast guided me a right and grant me Thy mercy. Surely Thou art All –bestower, and by Thy mercy save me from the fire. Oh Allah! Extend the span of my life and increase my subsistence and unfold Thy Knowledge. If there is any misfortune for me in the guarded tablets make it fortunate for me, for surely thou effaces what Thou pleases and inscribes (what Thou pleases) and art heart of guarded tablet”. O You, Whom angels glorify in the morning and night, O You, the Permanent and Eternal, the Bringer forth of plants in the early morning and afternoon, the Enlivener of the dead, the Resurrector of decayed bones, the Hearer of sounds, the Everlasting, the Dresser of bones that decay after death! O You, Whose limit cannot be perceived, Whose number cannot be counted, Whose aid does not cease, I bear witness, and the witness to me is honor and supply, and from me obedience and submission, and by which I hope deliverance on the day of sigh and regret, that You are Allah; there is no god but You alone with no partner, and that Muhammad is Your slave and messenger, Your blessing be on him and on his progeny, and that he has informed and carried out on behalf of You what was his duty to You, and that You always create, provide with livelihood, give, deny, exalt, humble, enrich, impoverish, disappoint, help, pardon, show mercy, forgive, overlook what You know, do not wrong, straiten, enlarge, omit, fix, initiate, reproduce, enliven and make die; have mercy on Muhammad and the progeny of Muhammad and guide me from You, give me from Your favor, spread on me from Your mercy, and send down to me from Your blessings, for You often have accustomed me to good and favor, given me too much, and uncovered my ugly deeds. In the name of Allah, the Beneficent, the Merciful. There are no means and no power without Allah the Most High, the Most Great. bismil laahir rahmaanir raheem laa hawla wa laa quwwata illaa billaahil a’liyyil a’zeem. بِسْمِ اللہِ الرَّحْمٰنِ الرَّحِیْمِ لَا حَوْلَ وَ لَا قُوَّۃَ اِلَّا بِاللہِ الْعَلِیِّ الْعَظِیْمِ. This is as much nearer to Chief Name of Allah as the blackness of the eye is nearer to its whiteness. It has the same effect which is of the Chief Name of Allah. In the name of Allah, the Beneficent, the Merciful. And there are no means and no power without Allah the Most High, the Most Great. bismil laahir rahmaanir raheem wa laa hawla wa laa quwwata illaa billaahil a’liyyil a’zeem. بِسْمِ اللہِ الرَّحْمٰنِ الرَّحِیْمِ وَ لَا حَوْلَ وَ لَا قُوَّۃَ اِلَّا بِاللہِ الْعَلِیِّ الْعَظِیْمِ. Almighty Allah will dispence seventy types of calamities such as leprosy and wickedness of Satan from him. 1) He will be saved from accidental death. 2) He will be saved from the questioning of Munkar and Nakeer, in the grave. 3) The squeezing of the grave and darkness will not effect him. 4) All the doors of hell will be closed for you. 5) Saved from all types of sicknesses. 6) He will open all 8 doors of heaven for you. LA ILLAHA ILLALAHU, MOHAMMADUR RASULUL LAAHI, A'LIYUN WALI YUL LAAHI, WA SALLAL LAAHU A'LAA KHAIRI KHALQIHI WA MAZ'HARE LUTFIHI MOHAMMADIN WA AALIHI AJMA'EEN-AT- TAYYIBEEN-AT- TAHIREEN, BE-RAHMATIKA YA ARHAMAR RAHIMEEN. O Allah, I beseech You in the name of the rights, Muhammad and his children have with You, to send blessings on Muhammad and on the children of Muhammad and let me see and recognise (the truth), (let me) have deep insight of my religion, certainty in my heart, sincerity in my deeds. well-being of my self, enough livelihood, and let me thank You always till the end of life…) ALLAAHUMMA INNEE AS-ALUKA BIH’AQQI MUH’AMMAD WA AALI MUH’AMMAD A’LAYKA S’ALLI A’LAA MUH’AMMAD WA AALI MUH’AMMAD WAJ-A’LIN NOORA FEE BASAREE WAL BAS’EERATA FEE DEENEE WAL YAQEENA FEE QALBEE WAL IKHLAAS’A FEE A’MALEE WAS SALAAMATA FEE NAFSEE WAS-SA-A’TA FEE RIZQEE WASH-SHUKRA LAKA ABADAN MAA ABQAYTANEE..
ALLAAHUMMA INNEE AS-ALUKAL EEMAANA BIKA WAT TAS’DEEQA BINABIYYIKA WAL A’AFIYATA MIN JAMEE-I’L BALAA-I WASH SHUKRA A’LAL A’AFIYATI WAL GHINAA A’N SHARAARIN NAAS..
ALLAAHUMA FAAT’IRAS SAMAAWAATI WAL ARZ”I A’ALIMAL GHAYBI WASH SHAHAADATIR RAH’MAANAR RAH’EEM A’-HADU ILAYKA FEE HAAD’IHID DUNYAA ANNAKA ANTALLAAHU LAA ILAAHA ILLAA ANTA WAH’DAKA LAA SHAREEKA LAKA WA ANNA MUH’AMMADAN S’ALLALLAAHU A’LAYHI WA AALIHEE A’BDUKA WA RASOOLUKA ALLAAHUMMA FAS’ALI A’LAA MUH’AMMADIN WA AALIHEE WA LAA TAKILNEE ILAA NAFSEE T’ARFATA AYNIN ABADAN WA LAA ILAA AH’ADIN MIN KHALQIKA FA-INNAKA IN WAKALTANEE ALYHAA TUBAA-I’DNEE MINAL KHAYRI WA TUQARRIBNEE MINASH SHARRI YAA RABBI LAA ATHIQU ILAA BIRAH’MATIKA FAS’ALLI A’LAA MUH’AMMADIN WA AALIIHIT TAYYIBEEN WAJ-A’L LEE I’NDAKA A’HADAN TOO-ADEEHEE ILAYYA YAWMAL QIYAAMATI INNAKA LAA TUKHLIFUL MEE-A’AD..
Recite Surah Al Qadr 10 times..
اَللّٰهُمَّ صَلِّ عَلىٰ مُحَمَّدٍ وَ آلِ مُحَمَّدٍ وَ اهْدِنِي لِمَا اخْتُلِفَ فِيهِ مِنَ الْحَقِّ بِاِذْنِكَ اِنَّكَ تَهْدِي مَنْ تَشَاءُ اِلَى صِرَاطٍ مُسْتَقِيمٍ. اَللّٰهُمَّ صَلِّ عَلٰى مُحَمَّدٍ وَ آلِ مُحَمَّدٍ الْاَوْصِيَاءِ الرَّاضِينَ الْمَرْضِيِّينَ بِاَفْضَلِ صَلَوَاتِكَ وَ بَارِكْ عَلَيْهِمْ بِاَفْضَلِ بَرَكَاتِكَ وَ السَّلَامُ عَلَيْهِمْ وَ عَلٰى اَرْوَاحِهِمْ وَ اَجْسَادِهِمْ وَ رَحْمَةُ اللّٰهِ وَ بَرَكَاتُهُ . This invocation of God’s blessings upon the Holy Prophet and his Household has also been reported to be recited on Fridays with a great reward. اَللّٰهُمَّ اَحْيِنِي عَلٰى مَا اَحْيَيْتَ عَلَيْهِ عَلِيَّ بْنَ اَبِي طَالِبٍ وَ اَمِتْنِي عَلٰى مَا مَاتَ عَلَيْهِ عَلِيُّ بْنُ اَبِي طَالِبٍ عَلَيْهِ السَّلَامْ. مَا شَاءَ اللّٰهُ كَانَ وَ لَا حَوْلَ وَ لَا قُوَّةَ إِلَّا بِاللّٰهِ الْعَلِيِّ الْعَظِيمِ. اَصْبَحْتُ اللّٰهُمَّ مُعْتَصِمًا بِذِمَامِكَ الْمَنِيعِ الَّذِي لَا يُطَاوَلُ وَ لَا يُحَاوَلُ مِنْ شَرِّ كُلِّ غَاشِمٍ وَ طَارِقٍ مِنْ سَائِرِ مَنْ خَلَقْتَ وَ مَا خَلَقْتَ مِنْ خَلْقِكَ الصَّامِتِ وَ النَّاطِقِ فِي جُنَّةٍ مِنْ كُلِّ مَخُوفٍ بِلِبَاسٍ سَابِغَةٍ وَلَاءِ اَهْلِ بَيْتِ نَبِيِّكَ مُحْتَجِبًا مِنْ كُلِّ قَاصِدٍ لِي اِلَىٰ اَذِيَّةٍ بِجِدَارٍ حَصِينٍ الْاِخْلَاصِ فِي الْاِعْتِرَافِ بِحَقِّهِمْ وَ التَّمَسُّكِ بِحَبْلِهِمْ مُوْقِناً اَنَّ الْحَقَّ لَهُمْ وَ مَعَهُمْ وَ فِيهِمْ وَ بِهِمْ اُوَالِي مَنْ وَالَوْا وَ اُجَانِبُ مَنْ جَانَبُوا فَاَعِذْنِي اَللّٰهُمَّ بِهِمْ مِنْ شَرِّ كُلِّ مَا اَتَّقِيهِ يَا عَظِيمُ حَجَزْتُ الْاَعَادِيَ عَنِّي بِبَدِيعِ السَّمَاوَاتِ وَ الْاَرْضِ اِنَّا جَعَلْنَا مِنْ بَيْنِ اَيْدِيهِمْ سَدّاً وَ مِنْ خَلْفِهِمْ سَدّاً فَاَغْشَيْنَاهُمْ فَهُمْ لَا يُبْصِرُونَ . This supplication, which is reported from Imam AliAmeer al-Momineen(عليه السلام) at the Night of Mabit, is advisably said each morning and evening. مَا شَاءَ اللّٰهُ وَ اِنْ كَرِهَ النَّاسُ حَسْبِيَ الرَّبُّ مِنَ الْمَرْبُوبِينَ حَسْبِيَ الْخَالِقُ مِنَ الْمَخْلُوقِينَ حَسْبِيَ الرَّازِقُ مِنَ الْمَرْزُوقِينَ حَسْبِيَ اللّٰهُ رَبُّ الْعَالَمِينَ حَسْبِي مَنْ هُوَ حَسْبِي حَسْبِي مَنْ لَمْ يَزَلْ حَسْبِي حَسْبِي مَنْ كَانَ مُذْ كُنْتُ لَمْ يَزَلْ حَسْبِي حَسْبِيَ اللّٰهُ لَا اِلٰهَ إِلَّا هُوَ عَلَيْهِ تَوَكَّلْتُ وَ هُوَ رَبُّ الْعَرْشِ الْعَظِيمِ.